There will be no school for students on Monday and Tuesday this week, but our staff will be hard at work wrapping up semester one and preparing for semester two. On Monday teachers will work on finalizing grading and compiling report cards for first semester. Staff will also take part in professional development on Tuesday. Students will return to classes on Wednesday, Jan. 23 for the first day of second semester. 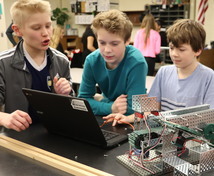 A group of young engineers were presented with a challenge: design and develop an efficient and effective process to manufacture a product. What made this unique was that the engineers were seventh graders at Stillwater Middle School and their assignment was part of the final project for their Automation and Robotics class. Read more. 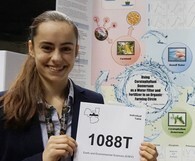 High school senior Haley Jostes has been named a top 300 scholar in the Regeneron Science Talent Search. The Regeneron STS is the nation’s oldest and most prestigious science and mathematics competition for high school seniors. Jostes’ science project focused on using an aquatic plant (coontail) to help farmers clean water polluted by fertilizer. The coontail could then be used to fertilize organic crops. Read more. 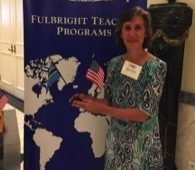 High school social studies teacher Sara Damon has been awarded a Fulbright Distinguished Award in Teaching (DAT) from the U.S Department of State and William J. Fulbright Foreign Scholarship Board. Damon is one of 35 U.S. educators who will travel abroad to eleven different countries through the Fulbright DAT program in 2018-2019. Damon will spend January to June 2019 studying in Gaborone, Botswana. Read more. 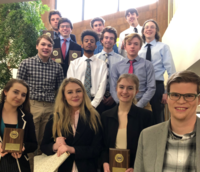 The Business Professionals of America club at Stillwater Area High School had a strong showing in the regional competition. Stillwater students took first place in two categories and third place in three others. About 100 students from eight area high schools took part in the competition. Read more. Congrats to Justin Siegfried and Claire Zdechlik for placing fifth in the BestPrep Minnesota Stock Market Game! Teams received a virtual $100,000 to invest in stocks and mutual funds. Portfolios are updated daily with real-time prices. Teams make trades on the internet using real ticker symbols and watch their portfolio value change with the stock market. The school board met on Thursday night. Check out the meeting notes for a recap of the meeting, or find meeting materials and watch an archived video of the meeting online. Recognize an outstanding staff member for their dedication, professionalism, and work on behalf of our students! Nominations are being accepted for the 2018-2019 Partnership Awards. Awards are given to two early childhood/elementary teachers, two secondary teachers, two retired staff members, and two current support staff. All current and past employees of Independent School District 834 are eligible for nomination. Deadline for nominations is Jan. 31. 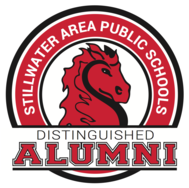 Do you know someone who graduated from Stillwater Area High School and went on to make a big difference in the world? If so, please consider nominating them for a Distinguished Alumni Award. Each year, we collaborate with The Partnership Plan to honor distinguished grads who have made the community proud. Nominate someone online. The deadline is Feb. 17.